The long story short, My Explorer companion got facelift by adding color to it. It was on Saturday I started my trip to my home town, on the way I need to pickup my distant relative for farming ideas. Hence the one way travel extended to 350kms to my home town and 50kms for the farm. 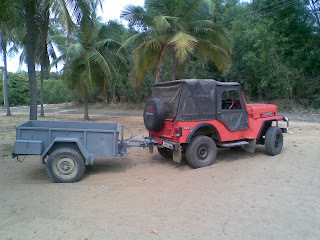 It was fairly a decent drive and the trailer did well with the Jeep. Hmmm I noticed the brand new looked trailer's NDMS tyres started showing its face. Looks like the tyres were unused for a long time and the rubber in the tyres are dry leading the edges of the tyres get broken during the long drive. On the way to my home town I visited East Cost Road for a minimum stretch and picked up my relative. 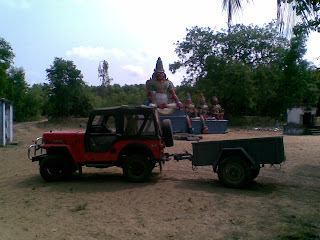 My trailer visited the “Ayyanar Samy” temple to take pictures; since the ECR is full of beach sand I had engage 4WD in the explorer. Later in the same day I reached my home town with no big troubles and the dawn set to dark. 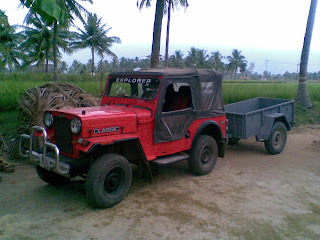 The next day (Sunday), Me, Explorer and the Trailer started our work at 4:00AM in the early morning going towards my farm to pickup around 500kilogram of farm outputs (Rice, Black eyed bean, Chilli and Jack fruit). 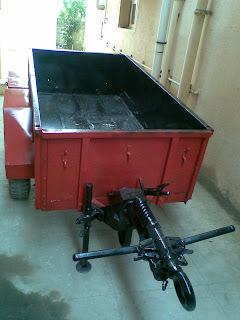 That was the first civilian load the trailer every carried in its life. I thought it will be a big stresses to the jeep, but my wonder no feeling of any addition. I reached back home at my native to drop all the goods and took the trailer for the body workshop. This is the same place I did my jeep restoration. Since it was Sunday all of the laborers were on week off. I managed to knock the senior painter and called him to do my work, before that I also did bit of arc welding on the body to hide few small holes as the tinker said it need more time to do pucca job. 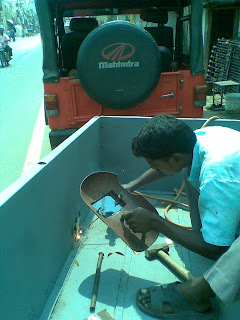 So welding and metal pasting, though the surface inside the trailer was not made evenly with the way arc welding has done. But it solved my problem. 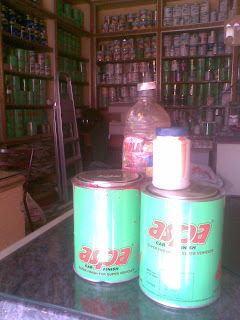 We had tough time as it was sunday and no paint shop was open for us to buy paints. Though I decided to use low cost paint to the trailer, My painter managed knock a closed paint shop and got the paint items he required. 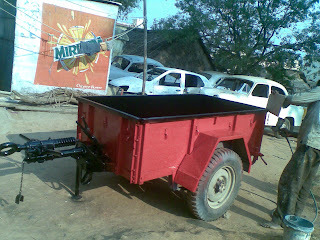 Painter started his work by metal pasting followed by application of putty and inner painting (black) and outer painting (red). 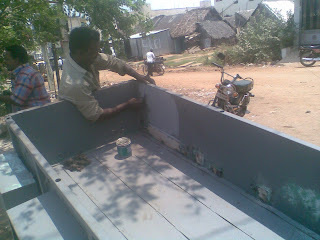 While the painter colored the trailer with red, the electrical power cut had happen and we had to abandon the job for about 2 hours. The trailer came out good but it was too late the job was completed around 6:30pm and I had to give 4 hours for the paint to dry. 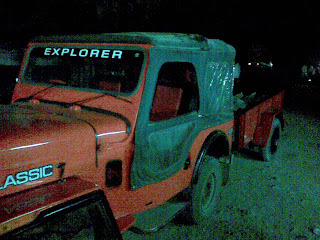 Since I went alone, 200kms of return trip without anyone as a passenger in the jeep during night trip with first time heavy towing experience was thrilling. Only I had bit of worry in my mind but the jeep or trailer didn’t show any symptom of the whole story and they sailed on the dark tarred road in the mid-night. First thing today I did was to click few pictures of the trailer for your eyes. 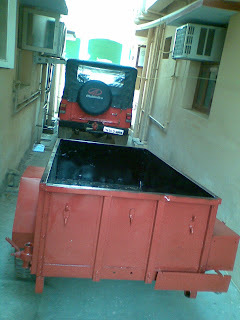 The Jeep and Trailer looked as if they made for each other at my home in Chennai. 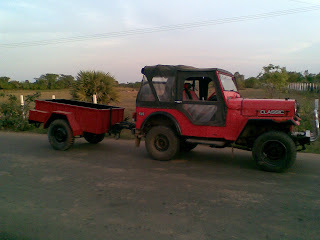 Though the entire weekend was busy for three of us (Me, Jeep and Trailer) the complete plan was successful and we made the restoration of Trailer with time and cost constraints but relatively better job. Registration number plate, electricals and T board are few missing items on the trailer and it will be carried over to forth coming weekends. 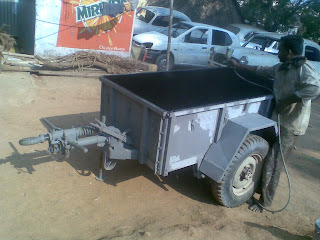 hi, Iam looking for a trailer just like yours, do you know wehre to get one in chennai?